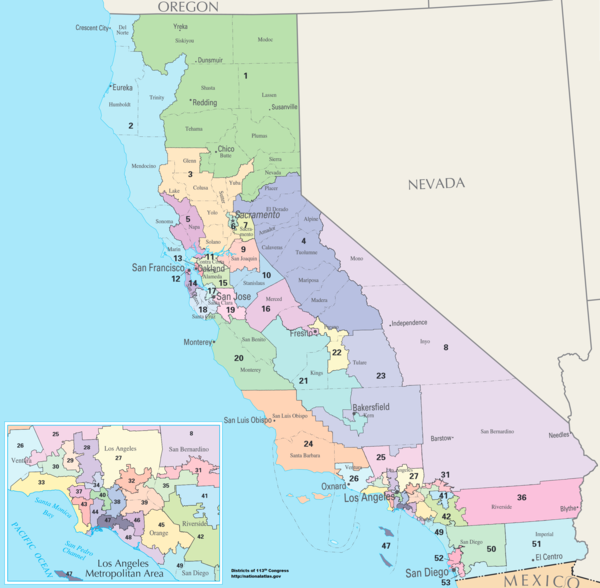 List of members of the Californian United States House delegation, their terms in office, district boundaries, and the district political ratings according to the CPVI. The delegation has 53 members, with 46 Democrats and 7 Republicans, including both the Republican Minority Leader, Kevin McCarthy, as well as the Democratic Speaker of the House, Nancy Pelosi. After the 2000 United States Census, California gained one seat. The 2010 United States Census, however, kept the state's apportionment at 53 seats. In 2012, owing to a new reapportionment method, some incumbent members chose to run in differently numbered districts (typically within a similar geographic region, with some changing their residence) and owing to a new open primary system, some incumbents were placed against opponents of their own party in the general election. For details concerning these changes and the specific effects upon the 2012 election see Politics of California. Tables showing membership in the California U.S. Senate delegation. As of January 2018[update], there are three living former senators. ^ Robert Matsui died January 1, 2005, after re-election to the 109th Congress but before the Congress started, and was replaced by Doris Matsui on March 10, 2005. ^ Tom Lantos died February 11, 2008 and was replaced by Jackie Speier on April 10, 2008. ^ Jane Harman resigned on February 28, 2011, and was replaced by Janice Hahn on July 12, 2011. ^ Juanita Millender-McDonald died April 22, 2007, and was replaced by Laura Richardson on August 21, 2007. ^ Blood, Michael R. (16 November 2018). "Democrat Porter flips GOP House seat in Southern California". AP NEWS. This page was last edited on 10 March 2019, at 08:24 (UTC).